On Sunday 1st June 2014, Belle Vue’s Andy Wood took on the 56 miles of the Comrades Marathon in South Africa in support of the charity Cardiac Risk in the Young. Thank you Andy for sharing your experience with us. 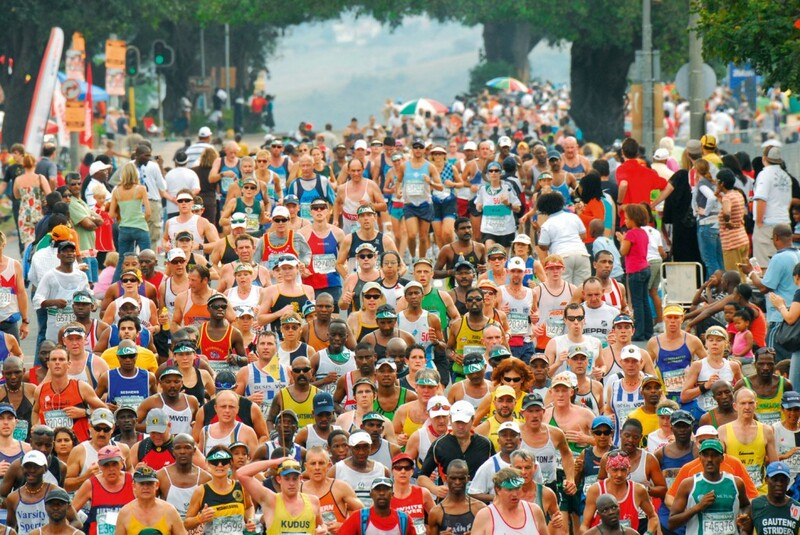 Comrades is the world’s oldest ultramarathon, a 56 mile run held in South Africa described as the “Ultimate Human Race”. Each year it alternates starting from either Durban or Pietermaritzburg and finishing at the other end. This year’s route was the ‘down run’, finishing at the coast in Durban. I first became aware of the race about 10 years ago and dismissed it as “too far” and “a ridiculous distance to attempt”. However as I approached 50 I thought it would be a fitting and original way to ‘celebrate’. So the race was entered and the flights booked. Just a small matter of the training now. The key seemed to be back-to-back long runs. I completed the Snowdon Marathon in October 2013 in my best time in 4 attempts, and so it began. Highlights in December were a 20 mile run followed by the Stockport 10, and, on New Year’s Eve, a flat but mentally tough 4 lap out-and-back Liverbird Marathon. Fortunately I remained injury free, bar a slight calf strain, and was able to PB in many cross-country events through the winter. April was an average 60 mile-a-week month, with an 83 mile week the peak including a negative split Manchester marathon, then a 24 mile round-trip run to do the Radcliffe 10k! Soon enough it was time for the real thing. I acclimatised in a very warm Durban for 5 days before the race, a few light runs including the Durban parkrun threw up all sorts of niggles and aches. 5.30am, 1st June: the dream was about to become reality, nearly 16 000 runners lined up as the National Anthem and Shosholoza boomed out and received a rapturous reception, the best start to a race I’ve ever experienced, adrenalin was flowing, let’s get going! Start slow was the advice, walk up the hills and save your energy … and there were plenty of hills! An hour and half into the race and we were treated to a sensational African sunrise, the encouragement from the enthusiastic crowd and support from the other runners was superb. Half way in five and half hours, so far so good, about now I was reminded of the words of Bruce Fordyce, who won the race for 9 successive years in the 1980s: “Your legs will get you half way, your mind the rest of the way.” So now it was all about the mind! As strange as it sounds, the day was passing quite pleasantly, the km-markers counted downwards, though at times the kilometres seemed like miles, it was hot and sunny but not unbearable, hunger pains came and went, my stomach’s limit of 5 gels helped, as did the 47 food and drink stations stocked with fruit, salted potatoes and sweets, plenty of drinks too. Regular mobile phone calls to Sandra, my wife, kept me focussed and motivated when the going was tough, as did the thought of raising money for my charity, Cardiac Risk in the Young. The down part really took effect in the latter stages of the run, when my quads really began to ache, I could still run on the flat and up the gentle hills but was reduced to a painful hobble down the hills. Quick calculations, about 10 miles to go, and I reckoned if I could keep going I would make the 12 hour time limit. Fortunately the last 3 miles into Durban were flat and as the sun was setting I jogged into a packed and noisy stadium eleven and a quarter hours after setting off. Tired and achy, shoes off and medal proudly around my neck, I watched in amazement as over 3500 runners finished in the 45 minutes before the cut off time of 12 hours, those that arrived a few seconds and minutes later received a standing ovation but no medal or recorded time! !